This was so super delicious. I was searching for a bread that I could make with the 3 cups of all purpose flour we had remaining. Challah was my favorite sweet bread from the Bread Baker’s Apprentice Challenge, and I quite enjoyed the process of braiding it. Then I realized that we had yummy dates and raisins in some trail mix that would go well, and I found this post on Smitten Kitchen and it all came together. I think I’ve previously failed to mention that our kitchen here in Guate has NO MEASURING TOOLS. For most of the recipes I’ve made so far I really don’t care, but when it comes to bread, I like to be precise. It was reassuring to see how well this loaf came out with no measure. The crumb is nice and buttery tasting and just the right amount of sweet. Whisk the yeast and 1 teaspoon honey into 2/3 cup warm water (110 to 116 degrees), and let it stand for a few minutes, until foamy. Mix the wet ingredients with a whisk, then add the salt and flour. Mix everything together with a wooden spoon until the dough starts to come together. Turn the mixture out onto a floured counter, and knead for about 10 minutes, until a smooth and elastic dough is formed. Let rise until doubled, about an hour. Meanwhile, in a small saucepan, combine the dried fruit, zest, 1/3 cup water, juice, salt, and a few grinds of black peper. Bring to a simmer over medium heat, and cook, stirring occasionally, until the fruit is soft and tender, about 10-15 minutes. Season with salt and pepper to taste. Remove from heat, and let cool to lukewarm. PRocess fig mixture in a food processor until it resembles a fine paste, scraping down the sides of the bowl as necessary. Set aside to cool. After your dough has risen, turn it out onto a floured counter and divide it in half. Roll the first half of the dough into a wide and totally imperfect rectangle (really, the shape doesn’t matter). Spread half the fig filling evenly over the dough, stopping short of the edge. Roll the dough into a long, tight log, trapping the filling within. Then gently stretch the log as wide as feels comfortable (I take mine to my max counter width, a pathetic three feet), and divide it in half. Repeat with remaining dough and fig filling. Arrange two ropes in each direction, perpendicular to each other, like a tight tic-tac-toe board. Weave them so that one side is over, and the other is under, where they meet. So, now you’ve got an eight-legged woven-headed octopus. Take the four legs that come from underneath the center and move the leg to their right — i.e., jumping it. Take the legs that were on the right and, again, jump each over the leg before, this time to the left. If you have extra length in your ropes, you can repeat these left-right jumps until you run out of rope. Tuck the corners or odd bumps under the dough with the sides of your hands to form a round. Transfer the dough to a parchment-cover heavy baking sheet, or, if you’ll be using a bread stone, a baker’s peel. Beat egg until smooth, and brush over challah. 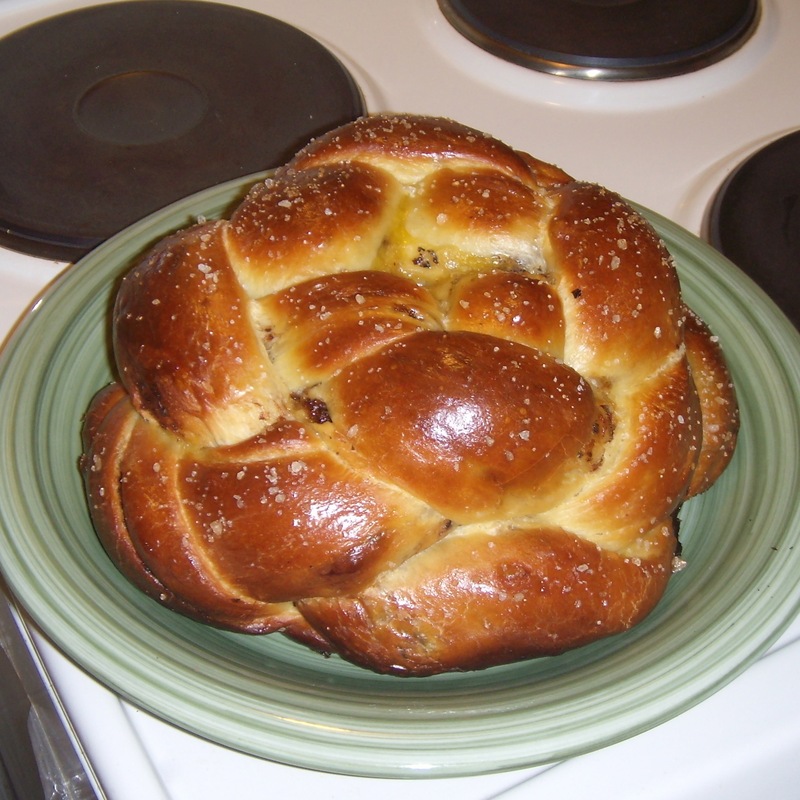 Let challah rise for another hour, but 45 minutes into this rise, preheat your oven to 375°F. Before baking, brush loaf one more time with egg wash and sprinkle with sea salt. Bake in middle of oven for 35 to 40 minutes. It should be beautifully bronzed, like the one above.